I’m not quite sure if I would call this a recipe, or even something I would normally post about, but I HAD to document how addicted I am to this Oregan Chai Latte Concentrate. And what’s even more amazing is how little of it I need to add with soy milk to get the perfect cold drink. Not only does this satisfy my morning or afternoon craving for that “something”, but it also gets me to drink 3 cups of soy milk everyday. This may be silly, but I also love having this drink in my new tumbler I recently purchased for this HOT summer we’ve been having. We recently went on a mini-family vacation and rented a condo near the ocean. Knowing I would want my iced chai latte, I planned on taking a carton of the concentrate along with us. But I had forgotten. My husband said we could go get some from the nearby grocery store, but I thought it was silly and of course I could live without it for a few days. 5 days later, i was CRAVING this drink, so when I came back home I knew it deserved a post. 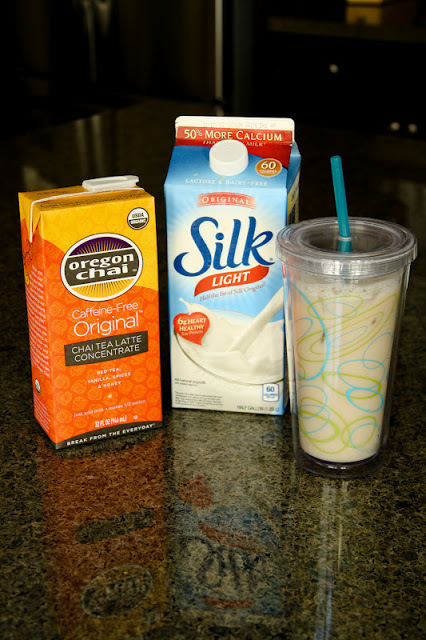 My favorite brand of soy milk is SILK. It’s extremely smooth and does not taste chalky as some of the other brands taste. I keep it quite simple and just add a small amount of the concentrate with Silk Light Soy Milk over ice. But you can always make it sweeter with some vanilla soy milk or almond milk. The chai concentrate I usually use has honey in it, but they also sell a vegan chai concentrate which is equally as good. I also usually get the non-caffeinated concentrate, but you can opt to get the one with caffeine if you prefer. Fill 1/2 of the Tumbler with ice cubes (do NOT use crushed ice). Add the 1/3 cup Oregan Chai Latte. Feel free to add more or less depending on how sweet you like your drink. Fill the remainder of the Tumbler with Light Silk Soy Milk. Mix with a straw and enjoy cold! Disclosure: There are affiliate links in this post. I don't get a shout out for pointing out the oregon chai mix to you when we randomly went to target that one time in the desert??? They also make dry packets which are easy for travel, although they are a little harder to find than the concentrate. Did you really point it out at target that time?? I started drinking this a long time ago (but just recently made the post)...I do remember you pointing some chai mix out, just must not have realized it was the same brand and mix! In that case, I'm going to have to hunt down those dry packets and see if they taste the same because I try to take this Chai with me everywhere! =) Thanks! !